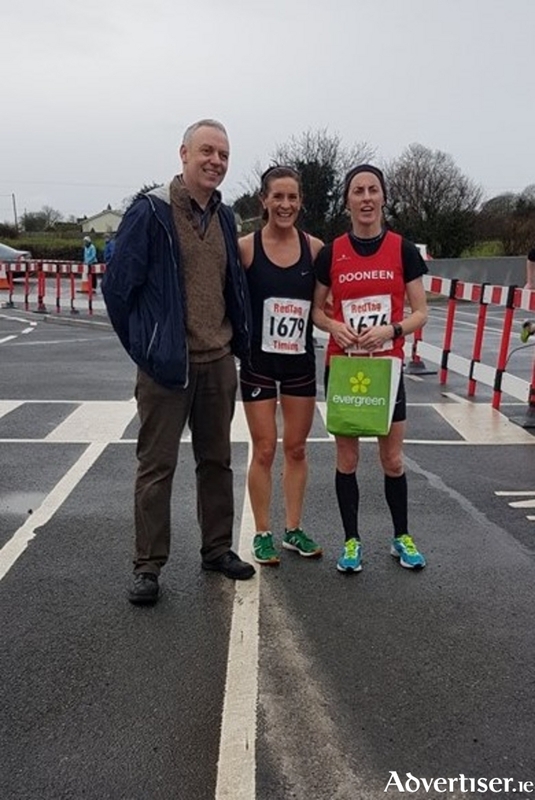 Harry Monson, Coldwood four mile race director, with race winner Breege Connolly and Rosemary Ryan, second. Galway athletes produced some super performances at the National Indoor Junior and U23 Championships in the AIT Arena. Three women secured gold, Veronica Burke, Alanna Lally, and Solange Carla, while there were bronze and silver medals for other local athletes. Burke of Ballinasloe and District AC continued her winning ways with a superb victory in the U23 women’s 3k walk, in a time of 14.37. Alanna Lally, formerly of GCH and now running with UCD, stormed to victory in the U23 women’s 800m, winning in 2.10 with a huge margin to spare. And the third goal came from Solange Carla of GCH who won the U23 triple jump with a best of 11.13 metres. Jack Dempsey of GCH secured a silver medal in the junior men’s 60m sprint after a dramatic photo finish with the winner Joe Gibson of Bandon AC. Dempsey clocked an impressive time of 6.97, dipping under the seven second barrier for the first time , and was only pipped by four-thousands of a second for victory. Sinead Treacy of Craughwell AC took double bronze. She secured the medals in the U23 long jump with 4.75 metres, and also in the 200m, clocking 26.23. However there are heartbreak for Nicole King of Galway City Harriers. She led from gun to tape in the junior women’s 400m, crossing the line in first place in 56.23, but was disqualified post race due to a lane infringement. In a successful second qualifying round at the National Indoor League day two in Athlone IT, GCH mens and ladies’ teams, and Craughwell AC ladies all made next weekend's finals to be held in the new National Indoor Arena in Abbottstown, Dublin. The men’s squad finished second after the two qualifying rounds, with strong performances by Eamon Hornibrook, with a 4.33 1500m, Igor Muntean, with 1.70m in the high jump, Henrique Nvokolata with a solid 12.10 leap in the triple jump, Jonah Erugo in the 200m, and Simon Callaghan, who scored valuable points over 400m. The GCH ladies produced some excellent displays, including Kathryn Casserly with a second-place finish and 4.47 clocking in the 1500m, Solange Carla with a second also in the triple jump, Aoife Sheehy who doubled up at high jump and 400m, and Laura Nally in the 200m. GCH team manager Brendan Glynn will have confidence in both his squads going into next weekend's final. Craughwell ladies, second in the final last year, once again made it through the qualifying rounds, and were anchored by captain Sarah Finnegan, who, along with sister Rachel, Laura Cunningham and Lorraine Delaney, ensured their squad made the final safely. Niamh Hennelly of GCH put in a strong season opening performance in the 1500m guest event, held alongside the league races, clocking 4. 59. Some 200 runners took to the roads at the annual four miler in Coldwood on Sunday. Matt Bidwell of Galway City Harriers took the honours once again, asserting his dominance on the local road racing circuit, and clocking a solid 21.09 for a clear victory. Philip Niland was second in 22.01, and Fergal Walsh of Athenry close behind in third in 22.05. Rio Olympian Breege Connolly won the women's event in a fast 22.54, ahead of another Olympian Rosemary Ryan, who clocked 23.39. Third home was Caroline Whiriskey of Loughrea AC. A huge turnout of 1,000 athletes competed in the South Connacht Championships in South Park on Thursday, where Eanna O Cualain of Colaiste na Coiribe and Aoife King of Pres Headford, both GCH athletes, were the senior winners. Presentation Athenry won an amazing five team titles – all four girls and one of the boys - as well as a second team placing. In the intermediate races, Thomas McStay held off the challenge from Aaron Brennan to take the boys' title in an exciting tussle, while Maeve Dervan (Mercy Roscommon ) just pipped Sarah Gilhooley for victory in the girls. In the junior boys Cillian Jordan of St Enda’s took victory, Bea Drummond of Athlone took the girls' honours. Shauna Brennan of Claregalway won the minor with Uyi Uyiosa of St Enda’s winning the boys.